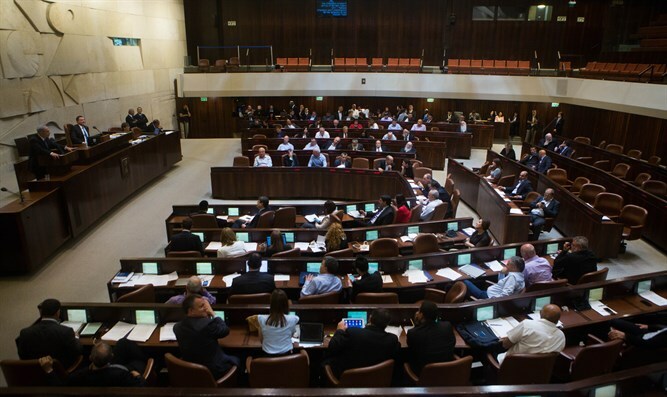 Knesset approves Nationality Law in second and third readings. 62 MKs vote in favor, 55 vote against, two abstain. The Knesset approved the Nationality Law in its second and third readings on Wednesday night. 62 MKs voted in favor of the legislation, 55 voted against and two abstained. The Nationality Law aims to codify Israel’s status as the nation-state of the Jewish people into Israel’s Basic Laws and establishes Hebrew as its sole official language while giving Arabic special standing. Prime Minister Binyamin Netanyahu welcomed the approval of the law and said, "This is a defining moment in the history of Zionism and the State of Israel. We have established in law the basic principle of our existence. Israel is the nation-state of the Jewish people." Immediately after the legislation was approved, many MKs from the Joint List got up and tore up the bill. Knesset Speaker Yuli Edelstein had them removed from the plenum. Edelstein welcomed the approval of the Nationality Law, writing on Twitter, "History in the Knesset plenum. We have approved a Basic Law that guarantees Israel's status as the nation-state of the Jewish people. Our national anthem, flag and right to settle in this land are guaranteed for generations to come! Well done to all my friends who worked to bring one of the most important laws ever passed by the Knesset." Minister of Jerusalem Affairs and Environmental Protection Ze’ev Elkin (Likud) said, "Today we made history. The Nationality Law was finally approved by the Knesset in its second and third readings despite the shouts and riots of MKs from the Arab list. The law has come a long way since I initiated it with MK Avi Dichter two terms ago. As of today, the status of the State of Israel as the nation-state of the Jewish people is protected at the level of a Basic Law in the State of Israel. The tenacity and determination has paid off." "As big as the opposition is to the Nationality Law, its importance is clear to every Jew and every person in the world," he added. MK Merav Michaeli (Zionist Union) reacted to the approval of the law and wrote on Twitter, "It's a sad moment when the Knesset of Israel approves a law called the 'Nationality Law' that has no equality, no democracy, and half of its members vote against it. All for the good of Binyamin Netanyahu and to the detriment of the State of Israel." Meretz chairwoman MK Tamar Zandberg said of the Nationality Law: "A shameful and painful night. Instead of a festive moment in broad agreement, a basic contaminated law was passed, which is entirely a political maneuver between Bibi and Bennett. According to this law, Zionism is not a national movement that built a home for a persecuted people, but a forceful nationalism that humiliates the minority and establishes racial superiority." Odeh added, "This is a law that goes against the Arab citizens, and even more so against democracy. It is easy to incite and persecute, but this is the time for all the democrats who live here together, Arabs and Jews, to unite against nationalism and racism and to put forward a different voice of equality and peace." Tourism Minister Yariv Levin, one of the initiators of the Nationality Law, said in a speech before the vote, "This is a historic day and a formative day. The Nationality Law strengthens the identity and the heritage and all the values thanks to which Israel exists”. "I turn to each and every one of the members of the Knesset: This is a historic and formative moment, do your duty and follow the path of the greatest Zionist leaders and founders of the state. Vote in favor of the Nationality Law,” said Levin.